Berlin: European Central Bank president Jean-Claude Trichet said in a newspaper interview the euro zone sovereign debt crisis was not yet over and that it was too early for the all-clear signal. Trichet said the agreements reached by European Union leaders this week need to be enacted in a very precise and quick manner. He called it “absolutely decisive" that those decisions are quickly and completely enacted. He said the ECB will carefully track the progress of governments’ reform measures and said the time had now come to “see some action". “The crisis isn’t over," Trichet told the German newspaper, according to an advance text released early on Saturday. “But after the decisions made this week, I’m nevertheless confident that the governments will succeed in restoring financial stability," said Trichet in one of the final interviews of his term leading the ECB. He said the precondition for that was “that the rules of the Stability and Growth Pact are more thoroughly and more aggressively implemented." Trichet said: “The decisions reached at the summit need a very precise and timely implementation. The euro zone’s government leaders have a programme, now hard work awaits the governments and European Commission. 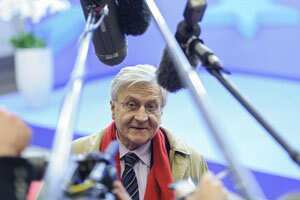 “The quick and complete implementation of the decisions is now absolutely decisive," Trichet said. Trichet said that the ECB would track the process closely. “We now need to see some action," he said. With regards to the ECB’s controversial sovereign bond-buying programme instigated to help fight the euro zone debt crisis, Trichet said the central bank had acted independently and not under political influence. “The ECB council decided all special measures due to monetary policy reasons and in complete independence," he said. “According to the treaties, the members of the ECB council cannot take directives from a government or interest groups." The ECB has been desperate to exit the bond-buying programme it began in May last year -- a measure that prompted two of its leading policymakers to resign amid concern that it took the bank beyond its monetary policy remit and into the fiscal arena. Financial markets however see the ECB as the only institution with the arsenal to bring the situation back under control if it deteriorates again and some ECB insiders expected renewed pressure on it to play a greater role in tackling the problems if the crisis refuses to subside. The ECB knows it cannot retreat completely at such a delicate phase of the turmoil when the troubles are beginning to have a major impact on the health of the global economy. On Wednesday, Mario Draghi, who takes over from Jean-Claude Trichet as head of the ECB next week, gave a thinly-disguised hint to leaders and the market that the ECB was prepared to keep buying bonds if needed.